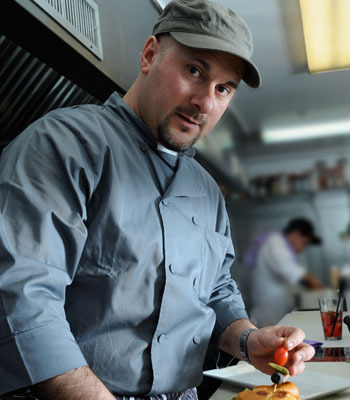 After opening successful restaurants Graziella’s and Blue with family members, DiFeo set out on his own with the Westchester Burger Company (WBC). So far the venture has been a resounding success, as the West Harrison resident’s burger has already piled up some local awards and has customers buzzing. The Original WBC Burger is comprised of 10 ounces of prime beef, blanketed in smoked mozzarella, garnished with frisse, tomato and pickles and slathered in DiFeo’s own secret WBC sauce. Already the burger has been named in Westchester Magazine‘s best of Westchester and was voted the magazine’s choice for best burger in the Hudson Valley. Recently it was also nominated for the award of best burger in New York on NYBeef.org. DiFeo is the brains behind the WBC burger without any extensive training in the culinary arts. He has created his work of art by trial and error and long hours in the kitchen. DiFeo learned his way around a kitchen from his mother, a chef for 37 years herself, while growing up in Silver Lake. He says that so far he has been lucky enough to not suffer any hefty failures, but he has learned from his mistakes and become better for them. DiFeo is already looking into his next expansion plans, but for now he is just happy with his current situation, especially his staff. When scouting locations for the restaurant, DiFeo came across the current address at 106 Westchester Avenue and figured it would be the perfect spot for him to launch his brand. Since he has driven through the area countless times, he figured Westchester Avenue would be an ideal location—so far it has worked out well. The Westchester Burger Company is set to open their second location in Rye Brook in about a month. DiFeo is trying to be as hands-on as possible in both places. Not only has he designed the layout of the kitchen, he has also put a lot of time and effort into building the restaurants as well.